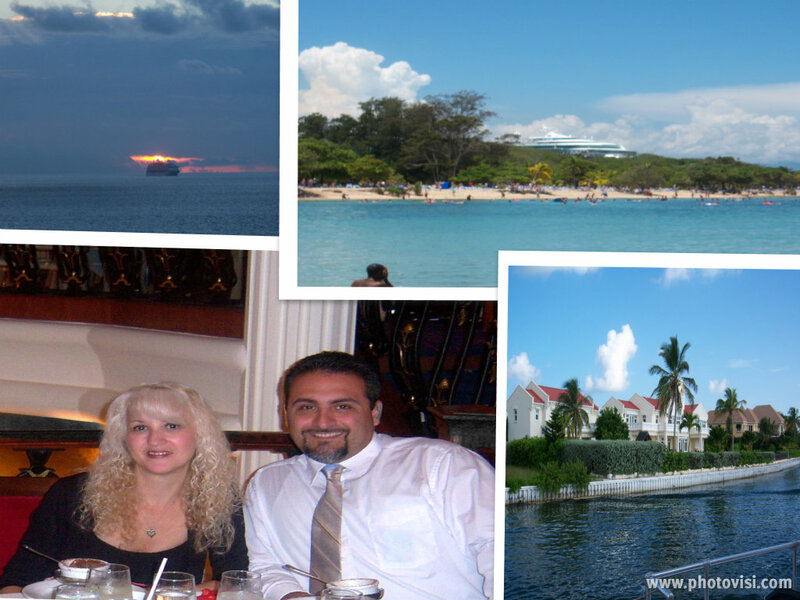 Starting out our cruise, welcome aboard craved out watermelons, amazing ice sculptures, and a huge luncheon and assortment of special desserts, chocolate covered fruits, tarts, cakes. We chose a room with our own private balcony, peaceful and warm. Every night, our attendant would leave us a towel animal, cute little elephant, a different one every night. Formal night we got to eat my favorite, lobster. 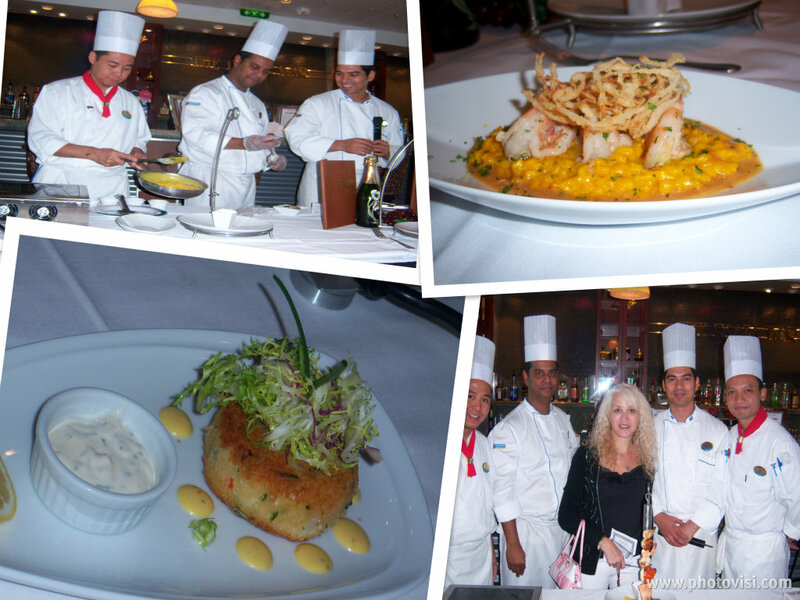 Loved the way everything is served on the ship so perfect in presentation and no cooking for me! Well I got to do my favorite past time, watch fabulous chefs cook in front of me, give me tips and make some fantastic Italian foods. Chefs from the Portofino Intimate Italian Dining Restaurant. They had a demonstration, I got to watch help and later eat some amazing risotto, bruschetta and mouth watering desserts. The dungeness crab shrimp cake with lemon butter sauce, above was so delicious! The risotto alla polpa di ranchio e Gamberetti (prawn and crab risotto) just amazing! I booked a reservation for this immediately after the demo. This was definitely one of the highlights of my trip. I enjoyed watching them cook, seeing the ingredients used to make this, the presentation, I was so excited, I couldn't wait to come home and try some recipes out! Just amazing ice sculptures everywhere, one more beautiful than the other, and flowers made out of vegetables. In the Grand Cayman we did a excursion with Stingrays and snorkeling. Yes, that's me with the stingrays all around. You can see their tales in the water swimming by me, very slimy but fun. On deck 14 we can see the whole ship and the fun on board, peaceful up there, had a nice glass of Cabernet and relaxed while at sea. Pineapple, cantaloupe, another amazing sculpture with fruit. We got up watched the sunrise on our balcony set up for a day for snorkeling, stingrays and lots of fun. Of course I had to add a recipe and now for my new favorite! So here it goes! In a small saucepan, bring the chicken broth to a boil over medium-high heat. Reduce the heat to very low, cover, and keep hot. Put 2 tablespoons each of the butter and olive oil in a medium saucepan over medium heat. When the butter has melted, add the garlic and shallots and saute, stirring frequently with a wooden spoon, until soft but not yet browned, about 3 minutes. Add the rice and saute, stirring, until the rice grains are well coated, about 1 minute. Add the wine and boil it, stirring until it has been almost completely absorbed by the rice, about 3 minutes. Using a large spoon or ladle, add about 1/2 cup of the hot broth to the rice. Still over medium heat, stir constantly until the broth has been absorbed and the rice looks almost dry, about 3 minutes. Add another spoonful and repeat, stirring after each addition until it has been absorbed, continuing just until most of the broth has been used and the rice is tender surrounded by a creamy sauce. Remove the pan from the heat and stir in the remaining butter and the Parmesan cheese. Season to taste with salt and white pepper and, if the risotto seems a little dry, stir in the last of the broth. Immediately heat the remaining olive oil in a skillet over medium-high heat. Season the shrimp with salt and white pepper and saute them until they turn white and firm, 2 to 3 minutes. Sprinkle them with lemon juice. Spoon the risotto a bed on 2 serving plates and arrange the shrimp attractively on top. Garnish with parsley and serve immediately. That's such a fun trip....got to tell my hubby :D Love all the pictures. Love all the animal sculptures. The food are just amazing. Wow, you dare to swim with sting rays! That's very brave. I think I would scream and frighten all the sting rays away...haha. But most lovely of all....you look so sweet in the pictures :D Thanks very much for sharing, Claudia. 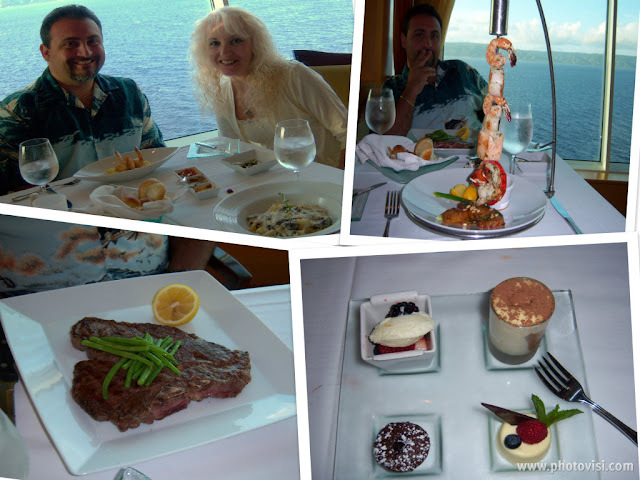 claudia,you and nemo had a great time!your trip was funny and relaxing and the risotto prowns sounds amazing! Wow! Food, food, and more food! What a vacation! You two make a gorgeous couple. Wow! What a vacation. Looks like you had quite the adventure, a great way to celebrate 10 years married! Both of you look extremely relaxed. Wow Claudia I need a cruise like that in my summer how wonderful and yummy photos!! What fun! You make me want to go on a cruise. The food looks excellent - and you look so cute with the chefs. I can picture you getting in there and helping them out. The risotto sound delicious too! Thanks so much for the risotto recipe - it looks amazing. It must have been heaven to be surrounded by so much beauty - a gorgeous way to celebrate a special event! And I have to say I'm enamoured of the towel animals. How much fun you had! Wonderful pictures. I have to admit I'm jealous. All that wonderful food and blue, blue water. I'm so happy you had a good time. I saw your post at Lazaro`s Blog and came over to say hello. What an amazing trip, lovely photos. Your risotto recipe looks very delicious. Happy 10th Anniversary! What a wonderful way to celebrate with a cruise to beautiful locations and, oh, all those gorgeous food and sculptures leave me speechless. I think my favorite parts (in living this trip through you!) are the animals - stingrays, animal sculptures and those adorable towels. LOL. Thanks for sharing the fun experience with us, Claudia! Your wonderful 10th year celebration was certainly well accompanied by all this beauty and tasty dishes. The cremini alfredo pasta...yumm. What a way to finish off a great cruise...Italian pastries...ahhh. Claudia...here's wishing you many more of these happy celebrations. Looks like a fun time!! I am scared of risotto but it's about time I give it a try! You lucky woman you! It looks like a wonderful trip. Being the goof I am my favorite thing that you showed was the elephant made out of towels (I love elephants). I would have snuck it home in my suitcase. Happy 10 years! It will be 10 for Dr Food and me in November. What a lovely trip!! Those animal towels are ADORABLE. You look so relaxed and happy. That risotto sounds awesome. The towels are cute, they even sell a book on how to make them, went to the class, that was fun too. I really love that the will find your sunglasses, there was a bat hanging in there one night, really cute too. thanks for all your kind wishes. I LOVE - LOVE - LOVE cruising. It looks like you had a fantastic time and so many wonderful places to visit. Did you buy the ships cook book? I bought the book and had it signed on my last cruise then my parents took the QE2 years ago and brought me a signed book. So glad you had a great 7 day vacation. What a great fun trip! You look so beautiful and relaxing on the photos. So happy to hear you can start getting back to cooking shrimp again. 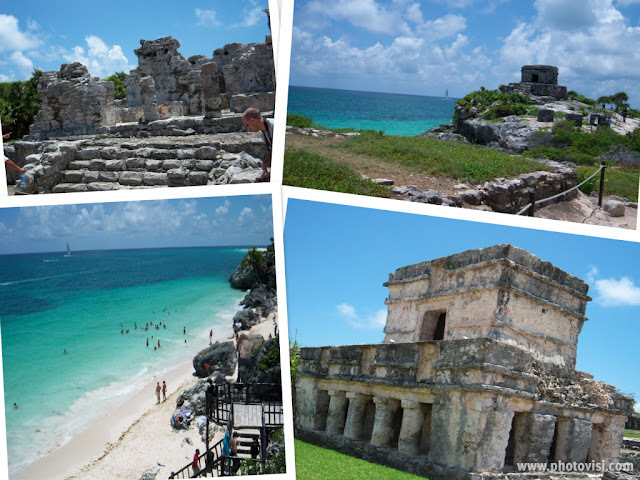 I loved Tulum but it was way to hot, and 8 hour trip between the ferry, bus, they touring. Long day. Sounds like you had a wonderful and relaxing trip! The risotto with prawns sounds fantastic! What a great fun trip! And all that delicious looking food! Your risotto sounds great also! Hi Claudia, just came from Lazaro's. Love your cheesecake! Hey, I've been wanting to go on a cruise for awhile now. Look at those beautiful photos, food, and such. Damn, I should have booked one for our anniversary. Looks like you had a great time! Recipe looks great. Beautiful display GF! Looks like you all had a fab time and great eats, of course. Cruises always have amazing food displays and I can see this one held to the standard! And with those adorable towel pets too, what more could there be to a vacation right. Girl... this looks so freaking great. Pap and I are taking a cruise in Feb. ..... can hardly wait. Wow what a gorgeous vacation and the risotto recipe sounds perfectly wonderful too! I've just started following although I've always been a frequent visitor. I'm Italian and just love reading other Italian blogs for new ideas and creativity! Please stop by my blog and hopefully follow back. I've got a brand new "Fresh Friday" blog hop going on to that you've got great posts to link up to. Ciao bella! Salute'! What a fabulous trip! The risotto sounds out of this world, too! Yum! Yeah this is the best one i ever seen I like it very much .and these pics are really great.